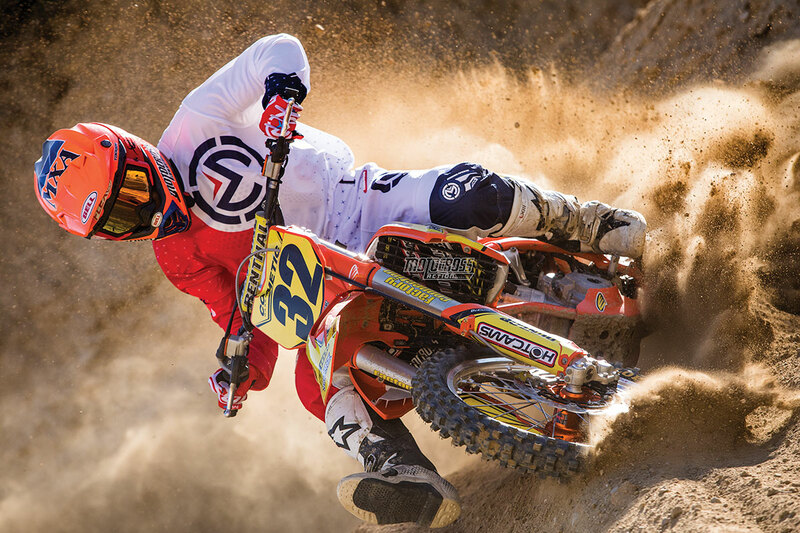 The KTM 250SXF has been MXA’s “250 Four-Stroke Shootout” winner for the last three years running. It is, in our eyes, a purpose-built race bike with no aspirations to be used on trails, woods or for play riding. It is a bike that is best in the hands of Intermediate- to Pro-level racers. 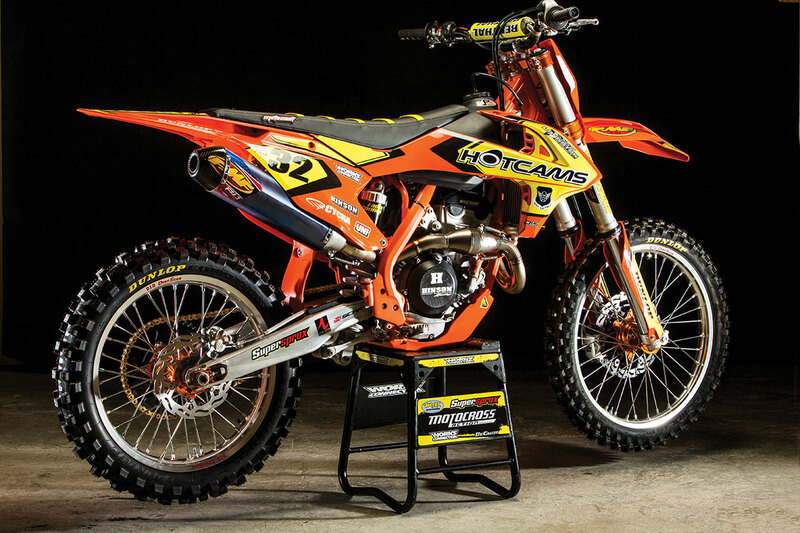 The KTM 250SXF revs to an outstanding 14,000 rpm where it produces 43.79 ponies. Don’t let the high-rpm powerband make you think that its power is handicapped in the lower half of the curve. It isn’t, although prior to the 2016 model, the 250SXF engine was much weaker from low to mid. 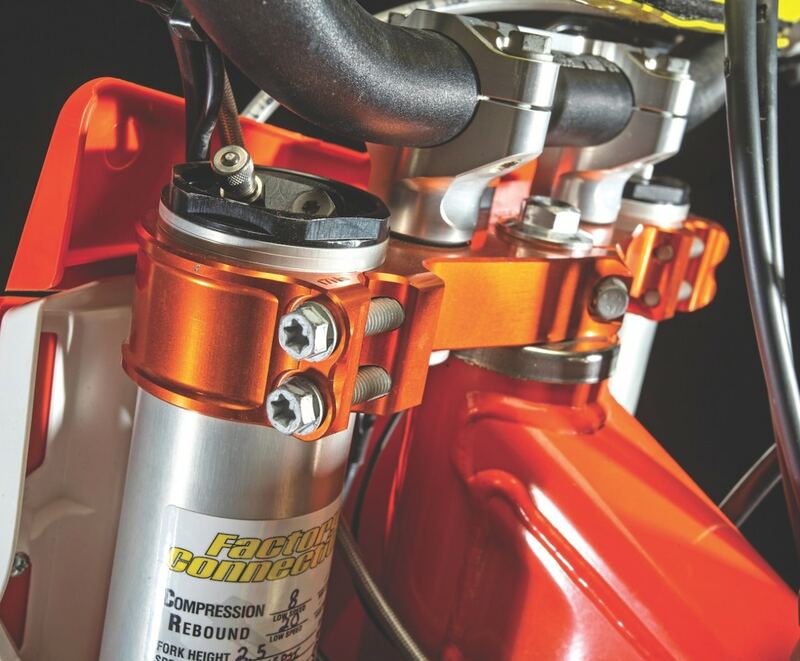 To keep a pre-2016 KTM 250SXF on the pipe, the clutch had to be fanned until the rpm climbed into its top-end sweet spot. The earlier KTM 250SXFs didn’t have engines that suited the average rider. But, in 2016, KTM fixed the power deficit, just as it fixed the atrocious WP 4CS forks of the same era. RANGE OF SKILLS AND WEIGHTS. THE GEAR: Jersey: Moose Racing M1, Pants: Moose Racing M1, Helmet: Bell Moto 9, Goggles: Viral Brand Factory series Pro 3, Boots: Alpinestars Tech 10. Cycra plastic and Decal Works graphics. We decided to find out if it were possible to build an easier-to-ride, more manageable KTM 250SXF. Our hope was to improve the bottom-to-midrange power and make some additional improvements along the way. We started with a used 2017-1/2 KTM 250SXF Factory Edition, which is essentially the 2018 KTM 250SXF production bike. Our wish list was to fill in the low-to-mid gaps in the powerband while bumping up the overall power. We didn’t want to lose the top-end advantage that KTM has—and, of course, we didn’t want to bust our budget. We entrusted Race Tech Engine Services with our engine build. Yes, Race Tech does more than just suspension. It is a do-it-all shop these days. ABOUT WAS THE YELLOW AND ORANGE LOOK. Race Tech ported the head, installed a Stage 1 Hot Cam set, bolted on a Vortex ECU, and dyno-tuned the engine to make everything run in harmony. We also added an FMF full exhaust, switched to a Uni two-stage filter and beefed up the clutch with Hinson clutch plates, springs and an inner hub/pressure plate kit. As most KTM racers know, the worst aspect of the KTM’s low-to-mid transition is caused by its Bonneville Salt Flats gearing. Luckily, this is an inexpensive fix. We swapped the ultra-tall 14/51 gearing combo for a Supersprox 13-tooth countershaft sprocket mated to the stock 51-tooth rear. 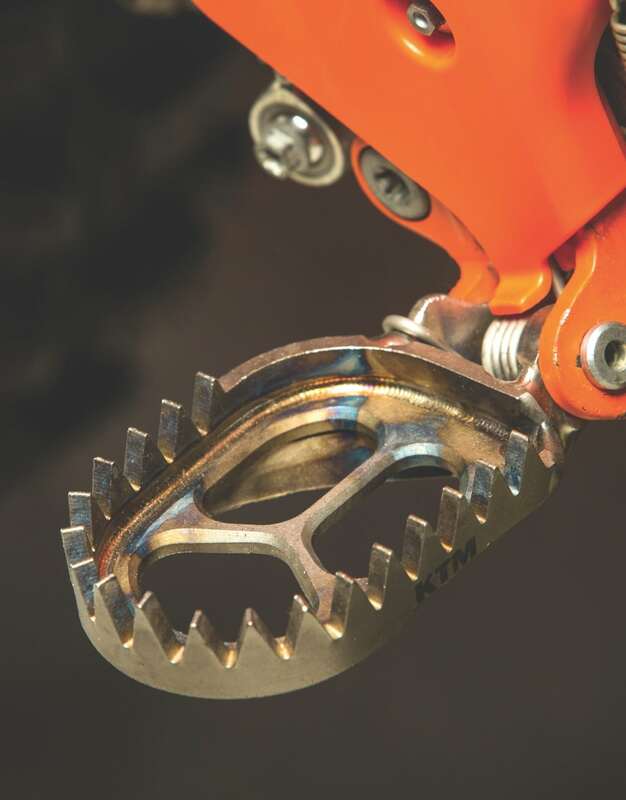 Bringing the countershaft sprocket down one size is similar to going three teeth bigger on the rear. That may seem like an extreme gearing change, but in reality it just brings the 250SXF gearing back to where it was a couple years ago. 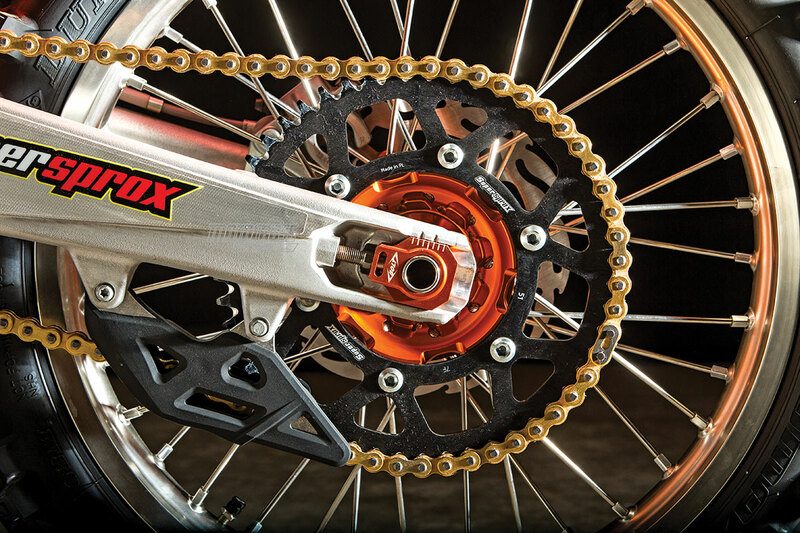 On the stock KTM 250SXF proper gearing is crucial, but switching to a 13/51 SuperSprox combo solved the problem. 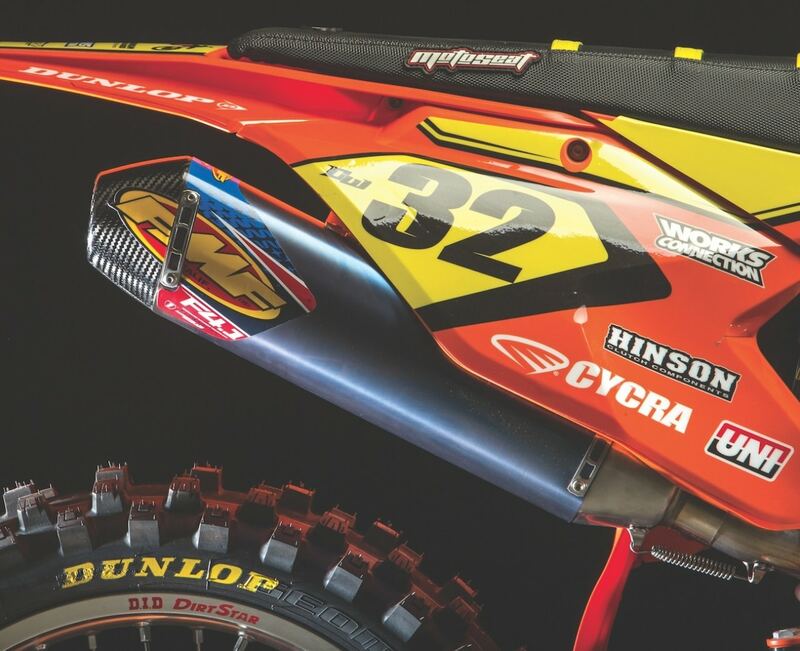 Every MXA test rider likes the stock WP AER air forks. They are in the ballpark for a wide range of skills and weights; however, we have had good experiences with re-valving the forks and decided to have Factory Connection massage and service our WP components specifically for a 185-pound Vet rider. As a final step, we mounted Cycra Racing’s yellow-and-orange plastic kit. We matched the plastic with a custom Moto Seat seat cover, Decal Works semi-custom graphics and a set of wheels built by Nore Worx. We went with silver rims—not because they look better than black rims, but because they look better longer. Race Tech isn’t just a suspension company. They have an engine department that built our 250SXF powerplant. 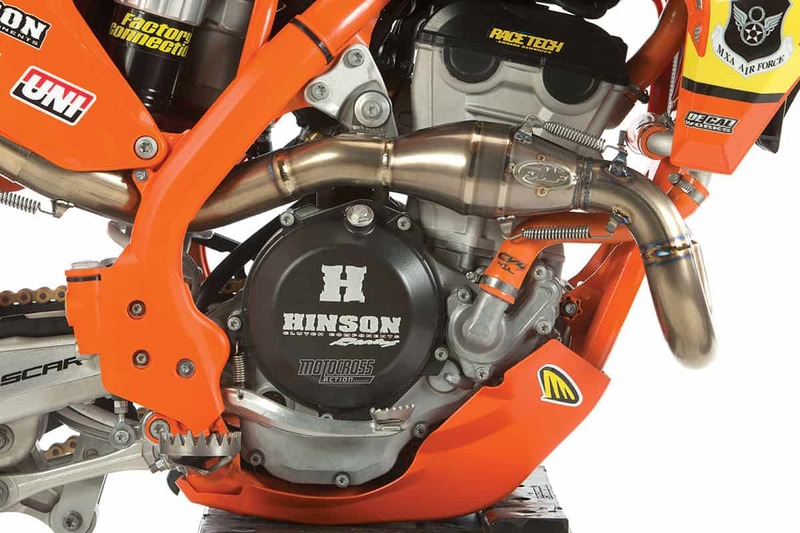 THE ENGINE: Race Tech’s handiwork made the 250SXF engine faster across the board yet easier to ride for all skill levels. We were surprised to discover that the bottom end had the instantaneous pickup of a 2018 YZ250F. The KTM mill was more responsive and revved faster. It got to the meat of the powerband quicker. While this made the 250SXF powerband feel shorter, it was actually a big plus for riders who previously had trouble getting to full tilt. 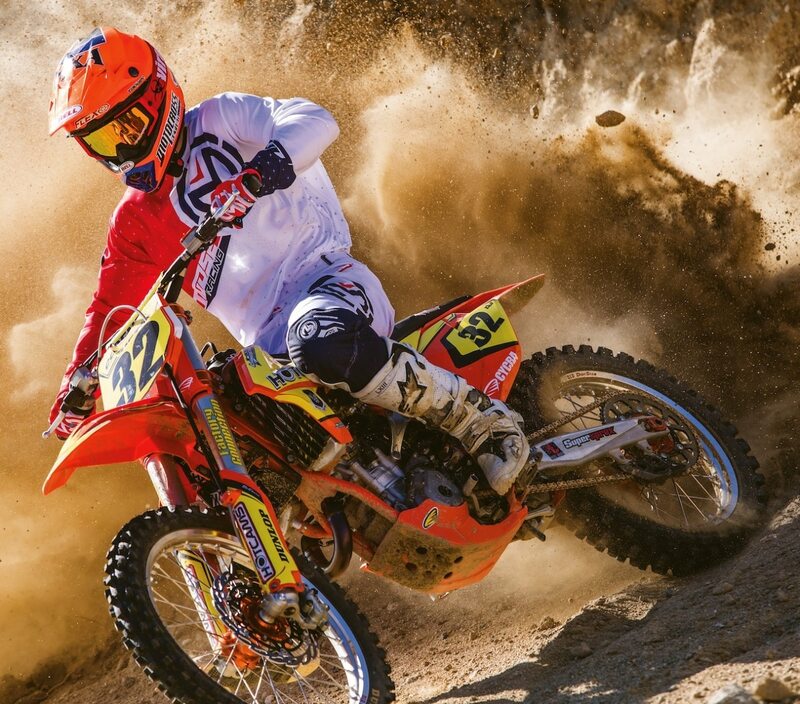 Amazingly, many KTM 250SXF riders can’t get to 14,000 rpm soon enough to take full advantage of the KTM’s 4-horsepower advantage. Race Tech’s combination of increased low-to-mid power and a quicker rev resulted in two things: (1) Racers didn’t have to wait until 14,000 rpm to shift. Being able to short-shift made lower-level riders more comfortable because they didn’t have to scream the bike to bloody murder. (2) Faster riders were able to ride a gear higher coming into corners and felt they were able to use the clutch less. They said the bottom, mid and top-end power felt more connected. Plus, they could get full measure out of the KTM’s amazingly broad rpm range. 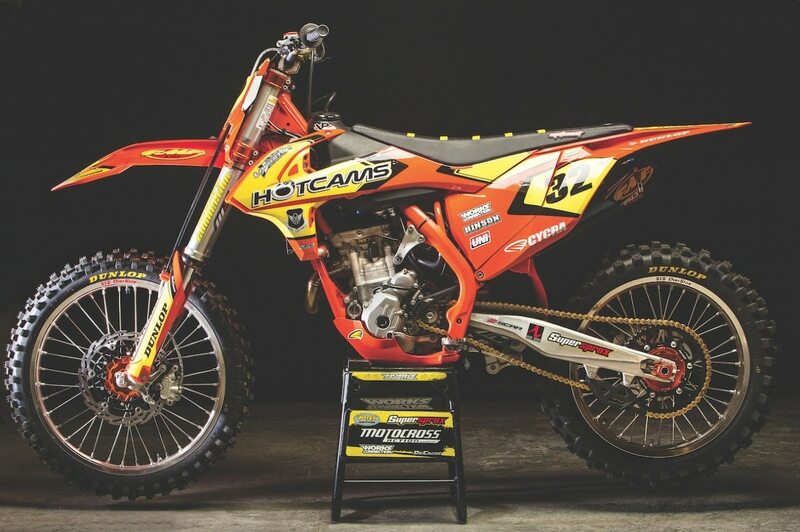 THE SUSPENSION: Within a few clicks and a few pounds of pressure, the Factory Connection technicians had our WP components dialed in for our 185-pound Vet test rider. Not including parts, the full re-valve, front and rear, cost approximately $450. On the track, the AER forks held up higher in the stroke, which made for a plusher initial feel. The shock had a more planted feel. The stock shock setting is a bit soft for heavier riders. The Factory Connection setup was stiffer and moved progressively. It did not wallow or G-out. Overall, it made the rider feel more confident when the rough stuff came into view over his front fender. 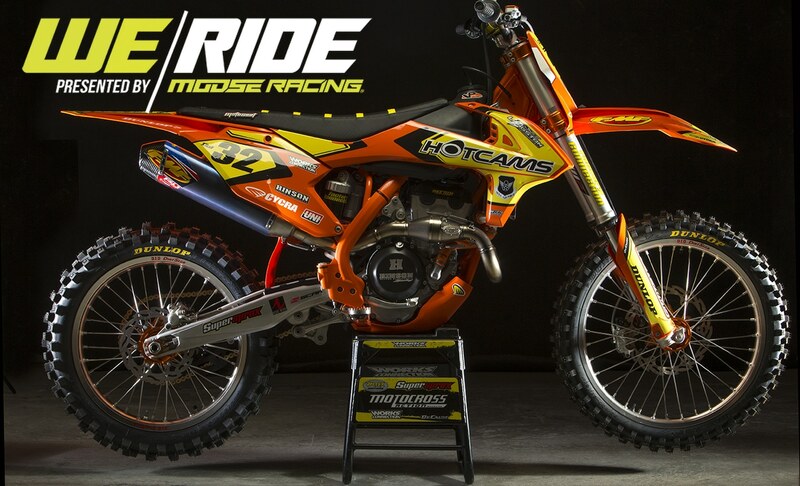 The Nore Worx wheels and Moto-Master rotor make the front wheel look aggressive. It stops instantly. Since most of the performance-enhancing parts are hidden inside the engine and suspension, everywhere we went people raved about the yellow and orange Cycra plastic. It stood out, and obviously most people in the pits had never seen that color combination before (at least not on a KTM). As for the hidden parts, we accomplished what we set out to do. 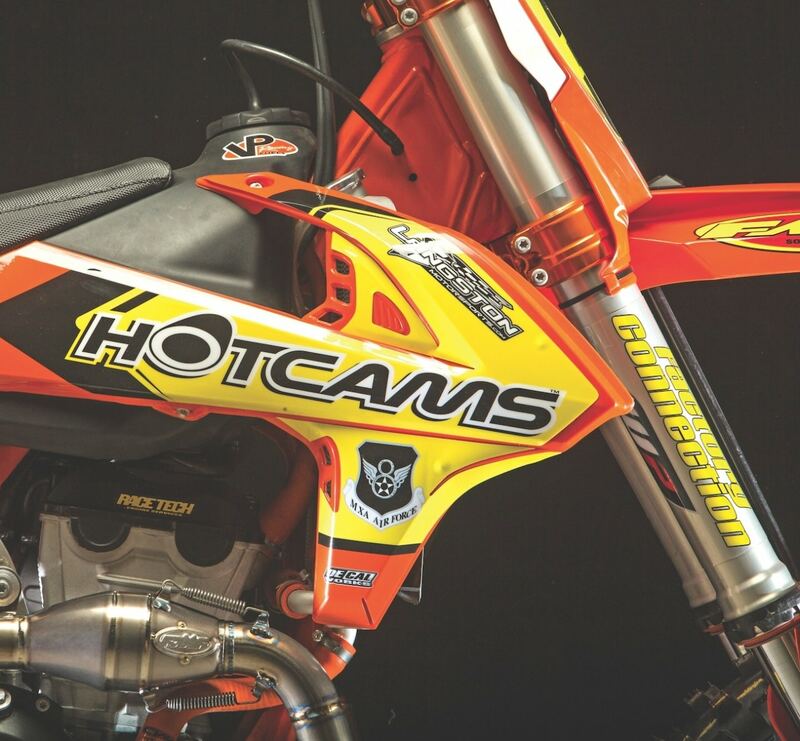 The KTM 250SXF is already the fastest bike on the track, so making it easier to ride for the masses was our goal. Race Tech surpassed our expectations by making it faster throughout the entire range while keeping it simple. The overall performance of the bike was a success. The icing on the cake was the contribution of Factory Connection to the suspension. There is value in tuning WP AER air forks for your specific weight, skill and track, and the WP forks are a great starting point. The Scar footpegs are sharp, beefy, wide and strong.